This week I want to share with you the directions to make a simple Irish Chain Mini Quilt. This is one of my favorites and when I read the label on the back I realized I made it in 1997. Wow – was it really that long ago? I am so glad I put labels with dates on my quilts (even the little ones). It finishes at 11.75” x 14.75”. Pick two of your favorite contrasting fabrics and all you need is one quarter yard (or a fat quarter) of each fabric. The blocks measure 1.5” finished. Be sure your fabric has a small print since you will be cutting these up as small as 1” (which is a .5” finished square in the 9-patch) or you can use two solids to create a nice contrast. From the light fabric cut four 1” strips and from the dark fabric cut five 1” strips. Sew the strips together as dark-light-dark (two sets of these) and light-dark-light. Recut these into 1” sections as illustrated below. You will make twice as many of the sets as above but then reverse the dark and light and use this second set of pieces as the middle of each 9-patch. Next sew these together into 9 patch blocks. Make 18 1.5” finished 9-patch blocks. From the light fabric cut out 17 2” blocks. Lay out all your 9-patch and plain blocks to look like the quilt. Sew them together in rows of five blocks across and then sew the seven rows together alternating the blocks. From the dark fabric cut two 1” x 8” strips – sew them to the top and bottom and then cut two 1” x 11” strips and sew them to the right and left. Next cut two 2” x 9” strips from the dark fabric and add borders to the top and bottom and then cut two 2” x 15” strips and add to each of the sides. Bravo! You little quilt top is done. Quilt as desired and add a dark fabric binding. Be sure to label it with your name, date, location and anything else you want to add. Hang it on your wall and enjoy it. Just for You – Quilt Quote “Quilting with a friend will keep you in stitches”. 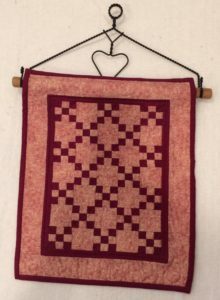 This would be a fun afternoon project to complete with a quilting friend. Call someone, put on the tea pot and have a great time.